See the history of our past 40 years. My father encouraged me to be my own boss from the age of 13. That idea sounded good to me but what kind of business ti run was unclear. 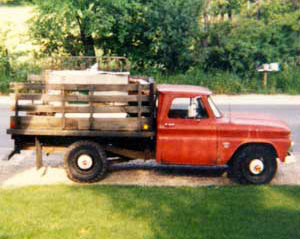 In the spring of 1978 I began looking at trucks to start hauling things. The hauling idea came from my high school entrepreneurial friend Rick Dasko who did some hauling and liked it – he told me about his business adventures. 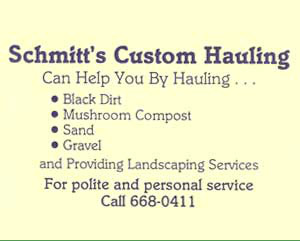 I bought a 1964 Chevy stake side truck from my teacher, Marty Brakin, and started Schmitt’s Custom Hauling. I had a hauling job the first day I bought the truck and took a picture of the very first load of junk in the bed of the Chevy in front of my Grandma Gener’s house. My childhood friend David Poitras ran the business for 3 months while I went to college in Kentucky. I left for home after the first semester and stayed in the Wheaton area ever since.